Such beautiful creatures of the animal kingdom found in our lovely garden spot! And I simply love taking pictures of them whenever I get the chance! Be it an ordinary fly, spider, or other small living things, all fascinates me so as they share our wonderful world of nature! 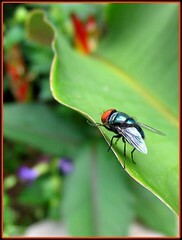 It is quite similar to a house fly, though larger. 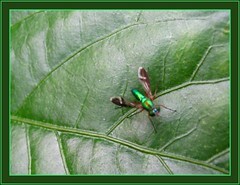 Pretty fly with a metallic body which can be green, blue or black in color. Check Wikipedia for more information! A beautiful tiny insect measuring only about 1 cm. with lovely pattern on its luminous body. Lots more images of these Longlegged flies can be enjoyed at BugGuide. 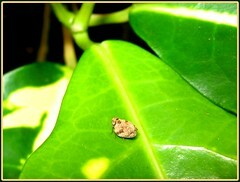 Another very tiny insect measuring only about 4mm. approximately. 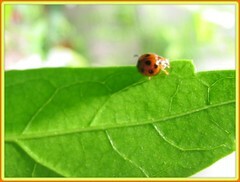 Frequently seen along our hibiscus branches and leaves, and in this image it’s strolling along a Croton leaf. Its beauty is not visibly seen with naked eye, but look awesome in photo! However, having compared the photos of other Issid Planthoppers that look quite grotesque…hmm…I’m wondering whether my tiny beauty identified with help from BugGuide.net is correct? Here’s a lovely homoptera photo album from Cedar Creek Natural History Area, University of Minnesota. 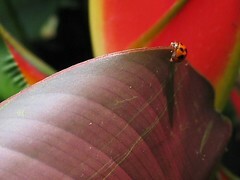 Just measuring about 0.5cm and prettily dressed in bright orange with black dots. 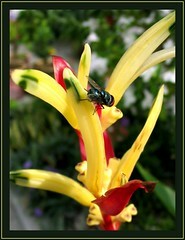 Hmm…just read at Wikipedia that they are voracious aphid-eater and now considered a nuisance or pest in some countries! Though for us, it’ll be wonderful to have more of these lovelies around to snuff off our much-disliked garden pesky gnats like the aphids and mealy bugs! This beauty looks quite similar to the Stink Bug. I found it crawling aimlessly around our courtyard. 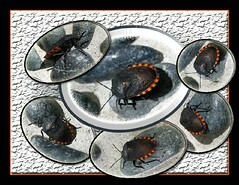 What a gorgeous insect with blackish brown body, beautifully textured and attractively trimmed in orange and black! Not very large, just about 20 x 13mm in size. Thanks to Professor David A. Rider of Dakota State University who generously help to identify it. A pity though I’m still unable to confirm its genus and species in spite of googling for its image umpteen times. Yet another pretty little winged insect, usually found in numbers flying around leafy plants on sunny mornings. Species – Unknown, wonder whether it’s Tachytes? More info/images at BugGuide.net! 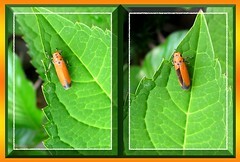 Another winged insect – that visited our garden, whose identity is unknown as yet to me. Approximate size: 20mm x 7mm. Apologies for incomplete information. 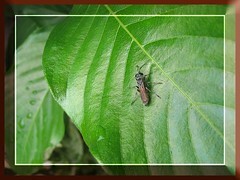 I’m just a nature lover and like to put a name to whatever insects or bugs found thriving or visiting our tropical garden, so if anyone out there knows more or detect an error here, would greatly appreciate your help! Flesh Fly (Sarcophaga spp.) is quite a beauty!